I think I could do a blog post about Target at least once a week. Seriously, they are just KILLING it right now in every category. When there is even the slightest hint of Fall (and I do mean slight, since we are in Texas), my desire to decorate goes through the roof. I think "cozy", "football", "fireplaces". However, my budget doesn't always agree with me. Target to the rescue! While there are tons of in-store pieces available, there are some amazing home decor pieces only offered online. Thank goodness it's the WEEKEND! Kids or no kids, we have them to thank for the millions of "back to school" sales right now. Here's a round-up of the best deals out there, along with the codes. Today's working woman looks a bit different than in years past. So many of us work from home, a casual office, and let's not forget the hardest working women of us all.... the stay at home mom! Personally, I can only wear yoga pants and a tee for so long before I begin to feel "messy". Don't get me wrong, I want comfy, I just also want cute. Your favorite reason to treat yoself is back! It's the 25 Under $25 - 25 super cute must haves that are $25 or less! Does it get much better than that? Check them all out below! Did you know Kate Spade has a home line? We're not just talking cute little home goods...there's FURNITURE. Kate Spade furniture, you guys! This is real. You can fill your house with Kate Spade, not just your closet! Check out some of the coolest pieces below! Bad news - the Nordstrom Anniversary Sale is coming to an end! But before it's over, you still have one last chance to grab all the adorable duds at ridiculously low prices. Prices go up August 8th! 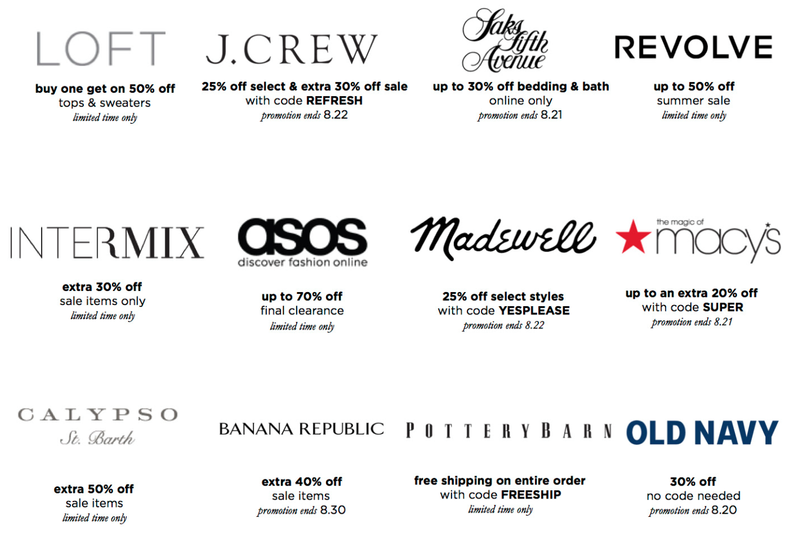 Here are a few of our absolute must haves to check out before the sale ends! Are your walls looking a little...naked? Every home and office can use a little art to add personality and make a space feel like you. Today we've got a little virtual gallery of some super cute wall art. Bust out the nails and thumbtacks and add your personal touch to those walls!